This semester, my first as a major seminarian, has truly been an unforgettable one. In the midst of taking new classes, adjusting to a new community, and falling deeper in love with the Lord, I also had the incredible opportunity to run the New York Marathon. When Father Michael Romano, our vocation director, first approached me about possibly running it with him, I will admit that I was a little hesitant. I had run the Atlantic City Marathon the year before, and as much as I enjoyed my first one, it wasn’t exactly an experience I was too eager to repeat. If any of you have ever run a marathon, you know the commitment and extreme discomfort that go into it. 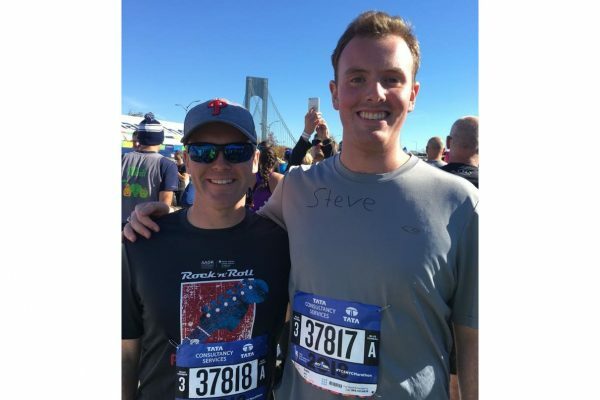 Seminarian Stephen Robbins (right) is pictured with Father Michael Romano, director of Vocations for the Diocese of Camden, in New York where the two ran the TCS New York City Marathon last month. The world’s largest marathon, it courses through the five boroughs of the city. Being my first semester of major seminary, I wasn’t too sure whether I wanted to make that commitment. But, little by little, everything seemed to fall into place. 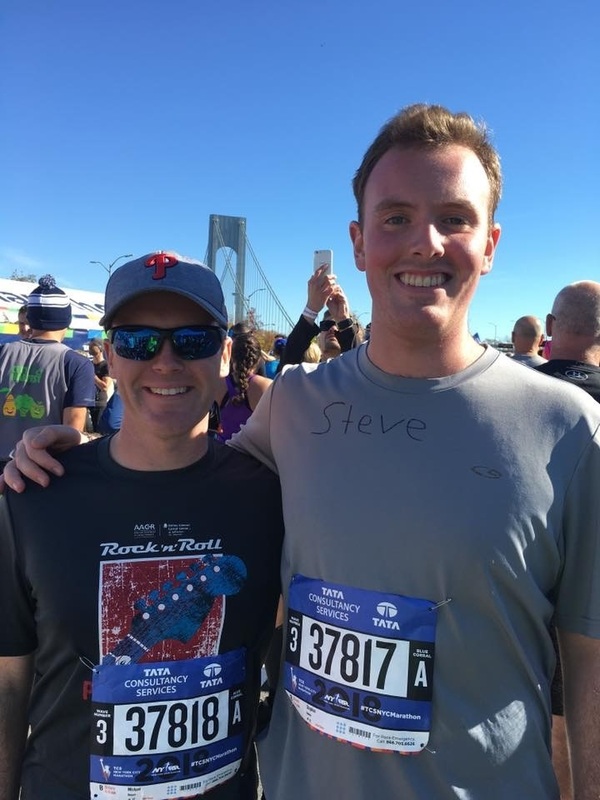 A friend of Father Romano’s was able to get us into the race despite our not fulfilling the qualifying time, and the day of the race happened to be a day off at the seminary because it was the day after New York’s diaconate ordination. New York is the largest marathon in the world, and is quite prestigious. I had no excuse; a once in a lifetime opportunity had presented itself to me, so I agreed to run. After a long few months of training, which involved running at least a half-marathon every weekend for several weeks, we at last arrived at race weekend. The night before the race, we went to the “marathon Mass” at Saint Patrick’s Cathedral. There was a standing room only crowd, with people lined up all over the back of the cathedral. After Communion, all of the runners were invited to come up into the sanctuary for a special blessing. It was an incredible atmosphere, gathering to celebrate the Eucharist with my fellow runners. The next morning, we had to get up very early to make it to the Staten Island Ferry by 6:15 a.m. so that we could get to the starting line in Staten Island. Riding the ferry that early, we were able to see the beautiful sunrise over the New York skyline. After waiting a couple hours for our flight to be called, at last it was time to run. Waiting at the starting line at the foot of the Verrazano Bridge, the energy and excitement were palpable. All those hours of training were for this moment. 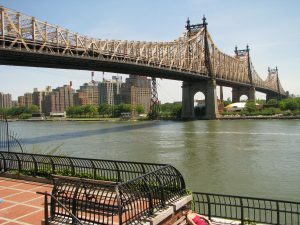 The Queensboro (59th Street) Bridge into Manhattan is one of the most arduous parts of the 26-mile race. The beginning of the race was amazing. It begins with a cannon blast and everyone runs across the bridge to Frank Sinatra’s “New York, New York.” We then crossed over into Brooklyn, where there were thousands of people lining the streets, cheering on all of the runners. 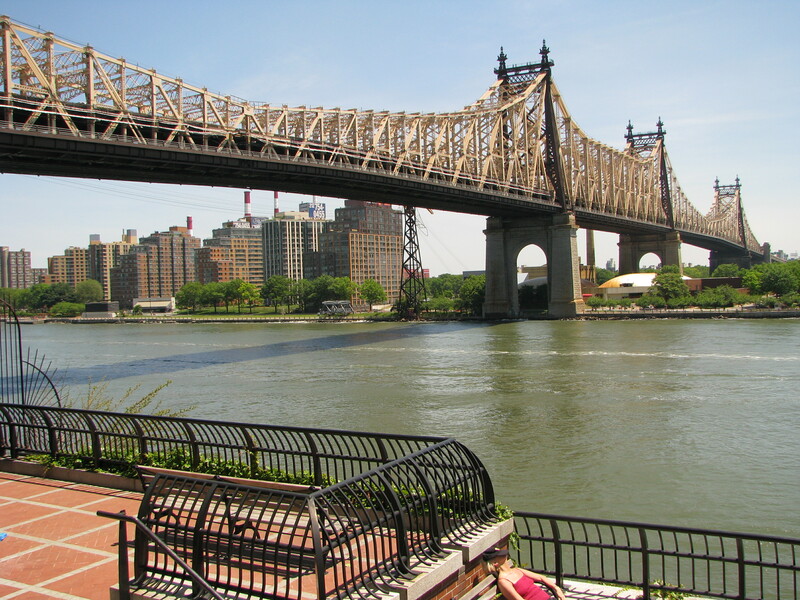 We would then make our way into Queens, and then crossed the 59th Street Bridge into Manhattan. The environment in Manhattan was quite rowdy. As we ran up First Avenue, it was a little overwhelming seeing all the spectators, but it was very encouraging. We very briefly ran through the Bronx, and then made our way back into Manhattan around mile 21. At this point, the race was getting pretty hard. Although it sounds crazy, the first 20 miles are pretty easy. The day before at the course-strategy conference they told us that we should treat it like a 20 mile long run and a six mile race. And, boy, were they right. The last push toward the finish in Central Park was a real grind. Around mile 23 I wasn’t sure I had anything left in the tank. If it weren’t for all the people cheering me on, I probably wouldn’t have made it. But at long last, I finally reached the finish line. When I finished the race, I was flooded with gratitude. Somehow, with the help of God, we were able to make it. It was truly an experience I will never forget. In those moments where I thought I had nothing left to give, I learned quite a bit about myself. It is a great reminder of how weak I really am. It is only by God’s grace that I am able to do anything. In those last few miles, the Lord showed me that when I hold nothing back from him, he will never leave me hanging. Whether I run another marathon remains to be seen, but all I know is that I’m very grateful for this one. Stephen Robbins attends Saint Joseph’s Seminary in Yonkers, N.Y.